JOURNALISM – at least in my shy mindset – has always been a scarily inaccessible who-you-know type industry. Even more daunting, I have always perceived newsrooms as a kind of elitist story-gathering cult, where facts are sacred and ignorance is punishable by death. In the weeks prior to starting my internship with the BBC, I feasted on news like never before in a desperate bid to appear, at the very least, ‘clued in’. From the Arab revolutions to the inner politics of local council elections, I aimed to become master of current affairs. However, all the courage my preparation garnered disappeared as I walked through the door of the building. The interior of BBC Scotland Pacific Quay – or ‘PQ’ as it’s called by the staff – is a magnificent open-plan chamber, flanked by balconies on every floor with a sandstone staircase dividing the middle; less a broadcaster’s headquarters, more a modern art gallery with offices hidden away out of sight. It all suddenly got very real then: climbing the sandstone steps toward our induction room, passing a big set of BBC blocks. Thoughts like “Am I ready for this?” and “Do I actually know anything about anything?” crossed my mind. When the door to the room opened, things changed. We were greeted with tea, biscuits, and a mountain of cake, complete with a set of handshakes and “How do you do?”s. 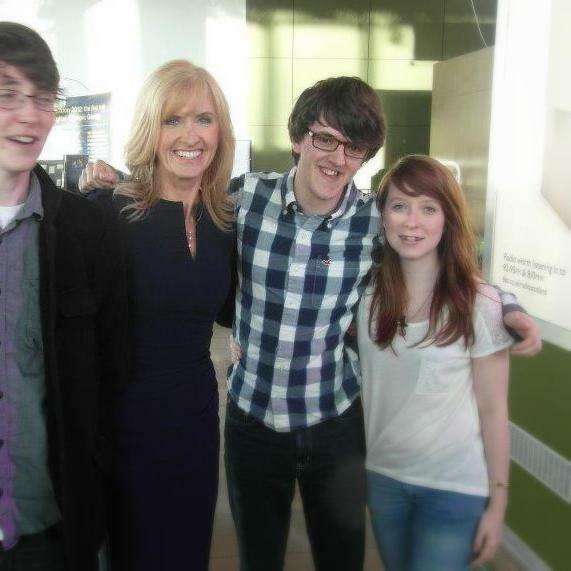 What cut the tension most, though, was Jackie Bird strolling in and greeting us with a nonchalant “Hello!” Somewhere between a loved school teacher and Mum, Jackie was seemingly briefed on us coming, and started our first day by giving us a pep talk. Over the next seven weeks we were given university-style lectures about story-gathering, along with some very hands-on workshops about scripting and filming. We were told to start thinking about Olympic themed story ideas that could be told about our local communities, and at the end of the scheme, we pitched our story ideas to Reporting Scotland and Good Morning Scotland editors. Some ideas got rejected, my own included. However I joined another trainee Niall instead, who pitched an idea for a story about the lack of Scottish coaching and training facilities for athletes, and how this meant Scottish athletes had to travel down south or abroad in order to achieve a desired standard of training. Niall had chosen radio when asked what kind of story he wanted to make, but since I was a T.V trainee, the story was picked up by both Reporting Scotland and Good Morning Scotland. After a week of scripting, recording, and editing, the story was broadcast on both T.V and radio. A great part of it was that we really were left to our own devices; from pitching to filming, we had to find our own interviews, book the places we wanted to film inside, figure out the structure of the piece and how it would look on each format. When it was time to edit, we were given a bit more help, but up until that point the content produced really felt like our own. Outside the trainee scheme itself, we were showered with opportunities to shadow and become audience members for shows. “Oh and by the way, if any of you are keen to shadow the Newsnight team, pop your name down here”, our boss Andrew would say, as if he was offering us a tic-tac rather than making a student journalist’s dream. When shadowing the Newsnight staff, I was sent out with Catriona Renton as she did a piece to camera in the west end. As Catriona practised her lines, I got chatting with her cameraman Dave, and that’s when the day really picked up. He showed me all the gizmos on his camera, and later that night I sat in on the edit with him before watching the day’s work from the gallery as we talked careers. Everyone at the BBC was very kind and welcoming. Their warmth was matched only with the unique and genuine characters that were my fellow trainees. Within hours of Day One, a Facebook group was made, and a kind of fellowship was formed. The most important, if not most memorable thing I’ll take away from working with ‘the Beeb’ are words from Jackie during that pep-talk on Day One. She reminisced about her own days as a reporter before she became the face of Reporting Scotland, saying that to be successful at it, you didn’t need to be a genius or have expert news sense. Instead, you need to put the work in, never give up, and don’t get disheartened at the prospect of failure. She said a journalist had to be like one of her favourite childhood toys, a weeble. “Weebles wobble, but they don’t fall down!” The whole room laughed, and I did too. But looking back, it was probably the soundest advice anyone’s ever given me. Posted in Features and tagged bbc, journalism, reflections. Bookmark the permalink. Smile, it’s . . . Autumn!